Quartz would be nice . Any thoughts on the movement? A quartz second hand that hit the markers would be good! Most quartz movements will drift in and out of alignment, some days they will hit the markers and some days they won't. Keep it similar to the previous version but offer it in a 40mm size too. Better, much better lume also. Just rejoice at that news! Eddie it's not too bad, it's just that the PRS10 is such a classic obviously. This one would look great to me, too, if it was formatted into a front-loading monobloc case field watch similar to the Citizen "Ray Mears" models, but with a heavy-duty steel notched and threaded retaining-ring securing its flanged crystal instead of the RM's pry-off type friction-fit crystal retaining-ring. 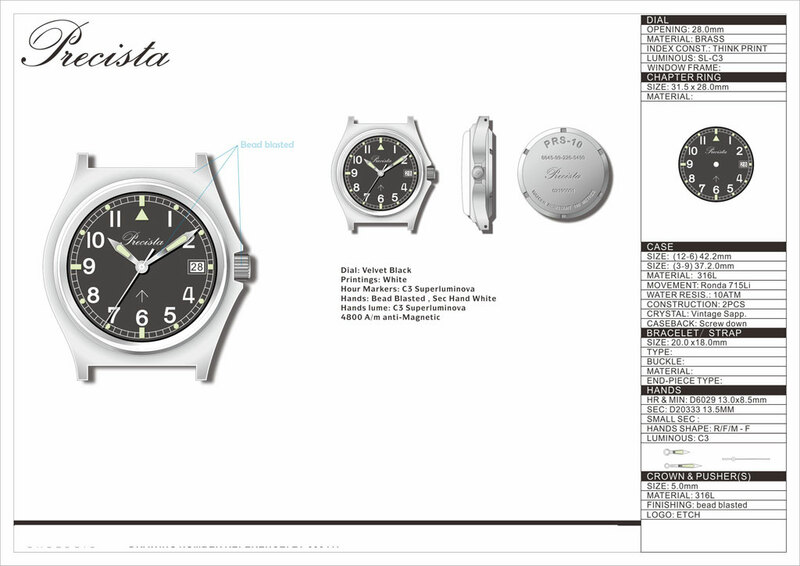 Going to such a format for a new General Services Watch is no more radical a move than returning to the format of the GS issue watch immediately preceding the famous G10 ---- the cushion style “cabinet” (front-loading/one-piece) case W10 from Hamilton, CWC, and Precista. 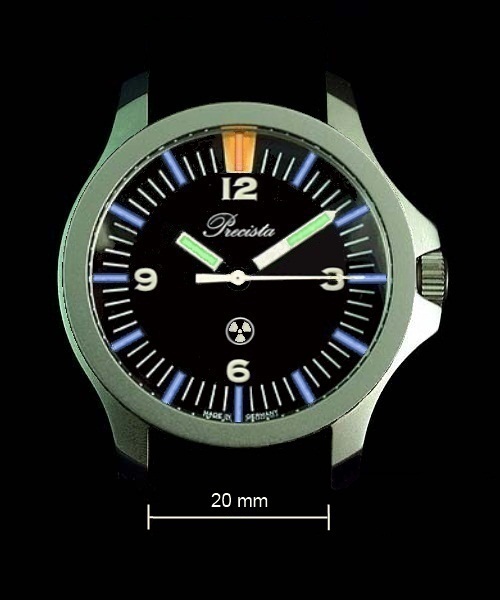 I think I would personally prefer it with the SuperLuminova, which I believe TF has an excellent reputation for doing right, instead of the tritium gas vials, though. The latter are expensive, have a limited useable lifespan, and ultimately will need to be replaced if you keep the watch long enough and still want to keep the lume functioning to its purpose. The SL works very well within its own parameters of use, and I believe it has an unlimited life-span if it stays safely under hermetic seal inside the watch's casing. SL is also going to be affordable compared to the full compliment of tritium vials shown in the opening post. I also think that the Ronda 715Li quartz mov't with 10 year battery life Eddie has used before is an excellent, and perhaps very best choice for a tough, affordable watch meant for a hard life. I like the little shiny tubes. They make me smile. What's reason for the monocoque case? Isn't a crewback case good enough? Seems a PITA to change battery or whatever else with a monocoque case. I think you’re definitely on the right track here boss! ^^if that doesn't keep the punters happy, then they need a slap in the face with a wet kipper. I'm guessing that there won't be an option without a date window? Oh dash it all, I'm such a fussy so-and-so. The last ones for sale were available with black, and white date wheels. I did have one with the black date wheel. Regreted selling it as soon as it was gone. Now i'm being tempted with another if this sells again. Oh wow, that is the one! Don't forget to write "3" on the tape with a crayon before replacing the crystal. That exact one is what I thought at the time it was last available would be the perfect beater/grab&go for me (still think that) and I intended to place an imminent order for the black date wheel version like the one you show. Then I found I had just missed it, as it had gone out-of-stock and then was discontinued, and I've always regretted taking for granted it would always be there and letting that slow me down from getting my order in. Seeing this picture of yours makes it worse (!!) because it reminds me just how neat looking these were and especially just how perfectly these were specificationed by my own personal lights, and all at just 90 GBP a shot. When they were gone, and still needing a new beater, I went with my second choice, and something that had been for a time in recent years an MOD limited trial issue to Royal Navy divers, the Citizen BN0000-04H 300m Professional Eco-Drive Diver in the nicely compact circa 38mm front-loading monobloc case which cost around 125 GBP equivalent here in the U.S.
That Citizen diver was a great watch for me in the years since, but I still would have much preferred that I'd have been using that first version of the Precista PRS-10 all this time and still, and I'm saddened it won't be back spec'ed as it was before. The current CWC G10 is £199 with acrylic or £298 with flat sapphire. ...and it has an ugly big "QUARTZ" where the pheon should be. Shudder. ...which is taking the proverbial. Exactly what Matt O. says, I'm very curious when the new PRS-10 (in any configuration but preferably as close to the original as possible) will be released. To close the gap I have an old CWC but while it is quite accurate I don't trust it to be waterproof at all because it started fogging while cycling in the rain. There are higher specification quartz but still no guarantee that the seconds hand will hit the markers all the time and I'm not aware of another with a ten year battery life. The drift of the seconds hand of the ETA F06.411 (PreciDrive) as used in the PRS-18 is far less than with a lot of of other movements and seems to behave very consistently and smoothly. Are these also available without COSC-certificates? (But then I also have a very cheap Asian dive-watch with virtually no drift at all, always spot on). That's why I specify Viton gaskets. 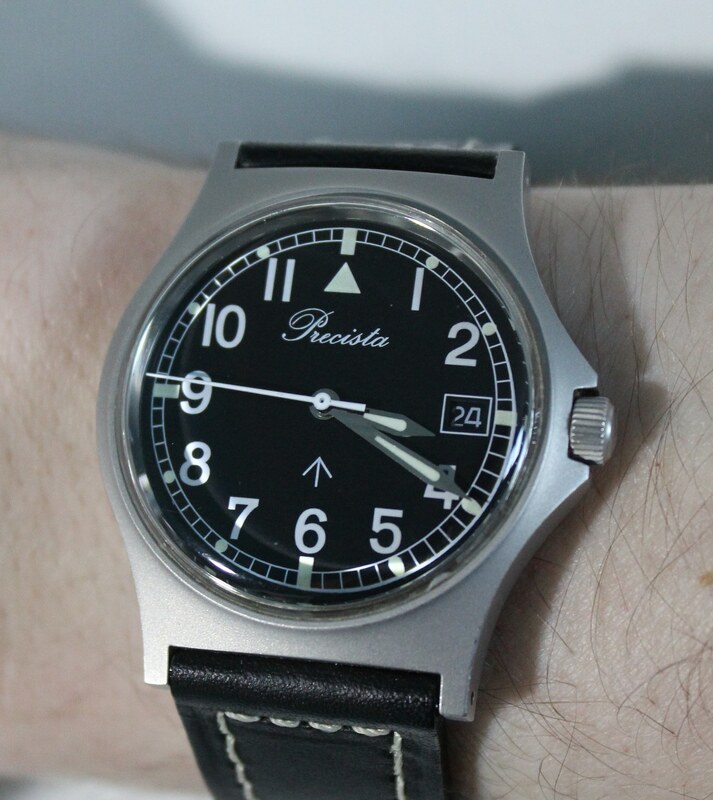 And...another watch I'll have to buy. And so it is but it's not cheap. The new Swiss Super-LumiNova® Grade X1 shows a performance increase of up to 60% after two hours compared to the standard grade. By using Swiss Super-LumiNova® Grade X1, the legibility according to the ISO 3157 standard will be extended by at least a factor of 1.6 on the long term. Swiss Super-LumiNova® Grade X1 defines a new quality standard of night visibility on your watch, which has never been seen before. I believe I'd heard of a new "Superized" SuperLumiNova at some point years ago, but had not to my memory heard anything of it since until now. It sounds good, though, great when I consider how much I like the regular SuperLumiNova already, but would it be more expensive than even the tritium gas tubes are? What lume was used on the PRS18Q COSC? I didn't find it compared well to the previous model. Hoping future Time Factors watched don't use the same lume as the COSC. Or was it the way it was applied? Thinner layer? The PRS-15 is the Lady Speedbird, which is still on the cards. A PRS-10 with a sapphire crystal. Ace!